Woodward Circle and Monroe St. Parking is recommended in the Compuware garage located at 1188 Farmer St., $8 for 3 hours. 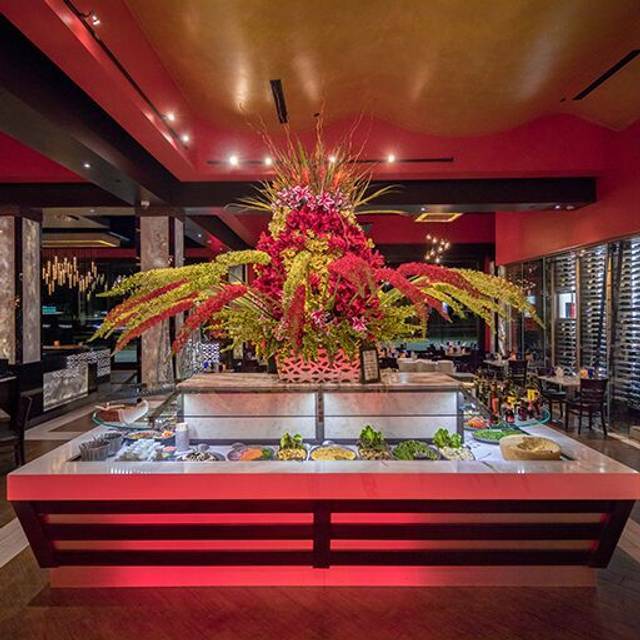 Texas de Brazil Detroit features one private dining room. The Brazil room can accommodate 50 guests comfortably. Almost Too Beautiful to Eat. 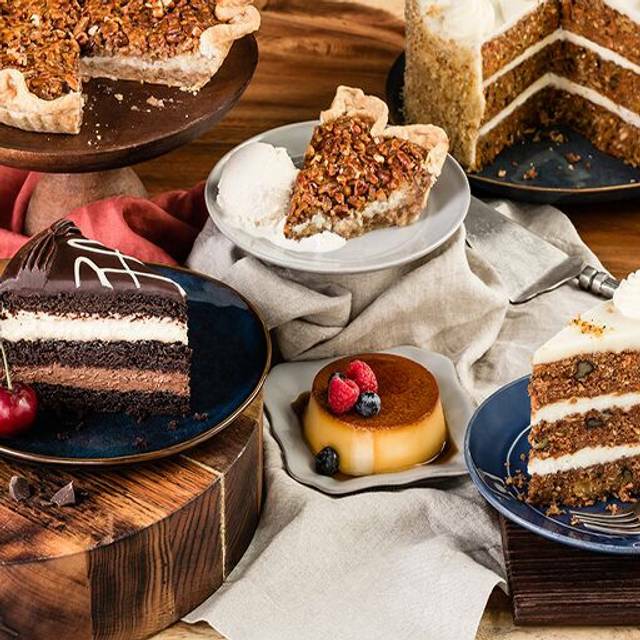 To conclude your dining experience, treat yourself to one of our delectable desserts. *Dessert is an a la carte item. Selections may vary by location or hours. This is a great place to go, our "special treat ourselves" place. Great staff and food; though won't be eating again today, will be in bed with a meat coma. Had to wait 30 minutes although had a reservation. Salad bar is small and not worth the price, especially compared to Fogo de Chao. Meat was over cooked. Restaurant was really busy and loud. Overall not a great experience. Excellent service on a busy Easter Sunday. It didn't seem like there were as many selections brought to our table as we have experienced in the past but we had plenty to eat. I am from Latin America , and I decided to take my family who are Americans for dinner at Easter. We got there and we barely saw the guys with the meat after 35 minutes . we all ended eating three plates of the salad bar instead of full menu including the meat.. the service was terrible .. we all at the table ate the salad and wanted to go because the frustration of no getting any good service and the amazing meat this restaurant they claim yo have ! we placed the green and nothing happened the meat did not come at all, so we gave up and ate a lot of salad ... Easter for us was a disaster because we chose this restaurant. We spoke with the manager and all he was concerned was to charge us for the salad we ate ... he did not care about the bad experience we had. I asked my server three times for filet, and three times she put the request into the computer, and three times, nobody came to my table (yes, they were serving it that day). Then I asked the flank server to get the filet server, and he said he would, and guess what? Again, no filet. I paid $50 for an average buffet, awesome lobster bisque, and a couple small pieces of flank steak. Absolutely not worth the money, considering the filet guy was apparently so busy he couldn't make it to my table the entire time I was there (an hour). Waitress was super nice, though. She got a good tip... but here's a tip for the restaurant: make sure your customers get the type of meat they want. 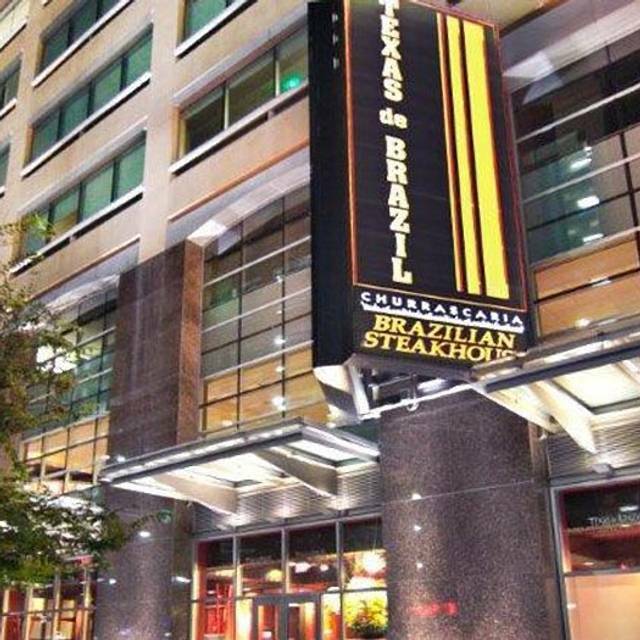 Texas de Brazil superceded our expectations! From the cuts of meat to the salad bar, every piece of food we ate was exquisite! We were there for brunch and even the brunch items were outstanding. I would recommend this place to everyone in the world!!! So good, so so good. The servers were more concerned with feeding the larger parties and often passed by our party of 2. The food is delicious though when you do manage to get some. Christian was an excellent server! Extremely friendly and he provided prompt service. Food was great, as usual. I had read lots of reviews about this site location and they were horrible. I was scared to go. My reservation was at 7pm I arrived 10 mins late we were seated 20 mins later NOT BAD from what o read about wait time. My table was seated right in front of the salad bar which was awesome, I was able to grab any gauchos walking by. My only complaint was the filet was so over cooked hard to chew. Lamb chops and shrimp by far was the best. I would suggest if you get anything off the salad Bar do small portions. 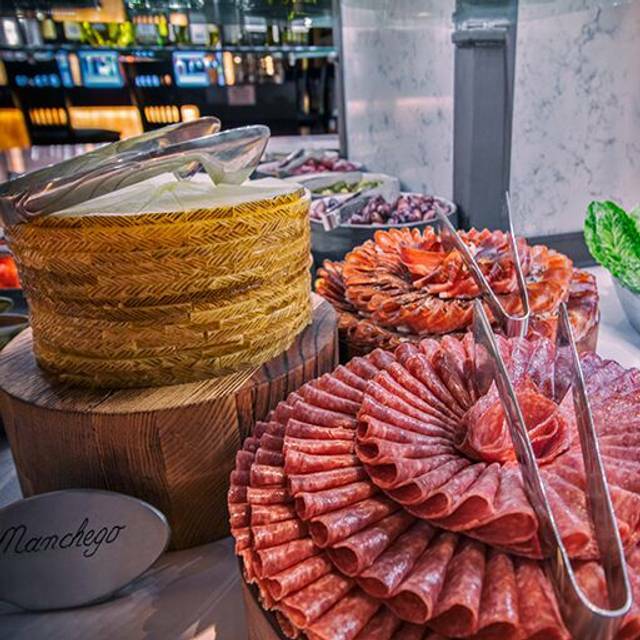 If not you will not be able to enjoy the selection of meat choices because you are so full. 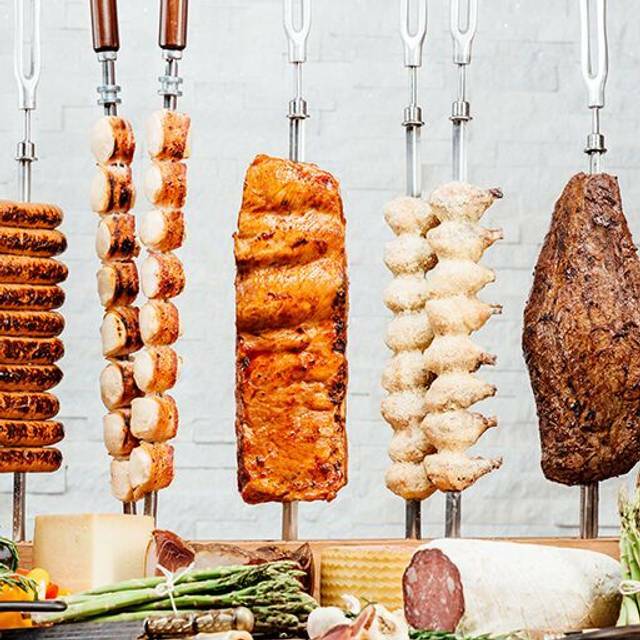 I would also suggest if you can get at least two or three different meat selections at one time. It will give you the opportunity to enjoy your company and meal without trying to watch for Gauchos to come by with the meat. Overall it was a nice experience to try, but not a place I have to visit on a regular. I was very excited to come here for the first time however we were stuck in a corner with a table next to us of about 10 people that were very loud. Since we were in the corner the people with the meat hardly ever came by we were offered meat the first time and had our buffet plates already gone. We had to ask the waitress to have them come over multiple times. Very disappointing. I have been to this location a few times and the past 2 times seem to be getting worse. The salad bar was out of potato salad when we were up there, the beets were impossible to get, myself and other customers had a hard time. The waitress was pretty good, but more than one occasion we sat for over 10 mins with no meat, they just kept walking past us while our cards were on green side up. I like the meat rare but it was beyond rare it was pretty much raw, to the point it was difficult to cut because it was so rare. When we ask for some to be cook medium rare it took our waitress asking twice to get it for us. We were celebrating our anniversary and wife's Birthday as well and we were both disappointed, for the price and now two bad experiences you have went from my favorite restaurant to one I do not need to visit again. Always great food and great service. Our waitress Felecia was very attentive and quick. Not sure why the servers are always forgetful and too busy to be attentive to our table. We frequently come once a month because it's my son's favorite place. But every time we do service is horrible!! I was put at a small table by a window and cash register. Had to pull the table away from cash register so my date didnt have to keep worry about being bumped. Also, since we were the last table in the row, we didn't get a steady passing of the meat. Luckily, the waitress saved the experience by asking us what meat we wanted and had them bring it to us. Basically, the seating arrangement needs work. They should put a party of 2 at a table after two group tables. Best Salad Bar in Detroit for all you Vegetarians. The steak is delicious and plentiful. The staff is friendly and very helpful. 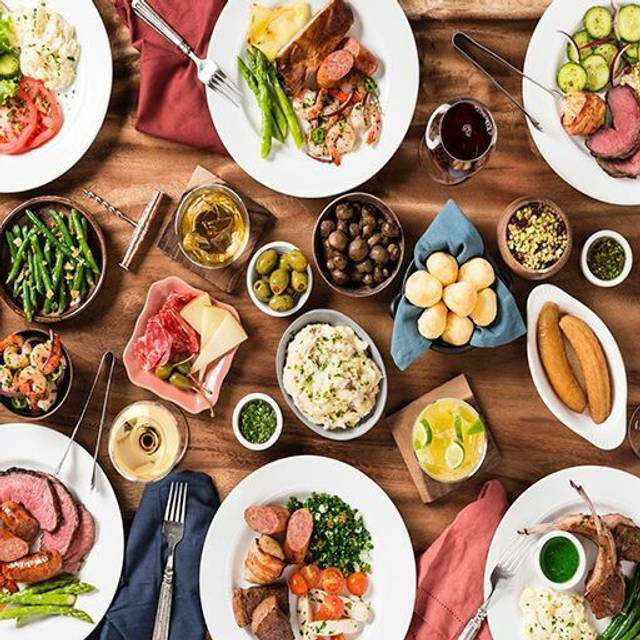 We always enjoy our meal at Texas de Brazil. Most of the meat was burned. We had to keep asking for more...even the well done was burned. The food servers fail to come to our table in a consistent manner. The waitress had to ask for service. Service was not well-timed. The food was excellent, our server was wonderful. We did have a problem where no one came to our table to offer us any of the meats for over a half an hour. We had our coasters on green, And we watched them come out and circle the edges of the room, tried to make eye contact and get their attention but we didn’t have any luck. We finally let our server know, and she made sure to send people to our table. I think they did not have enough of the meat servers for the size of crowd that was in the restaurant At the time, which was 7 pm on a Monday. 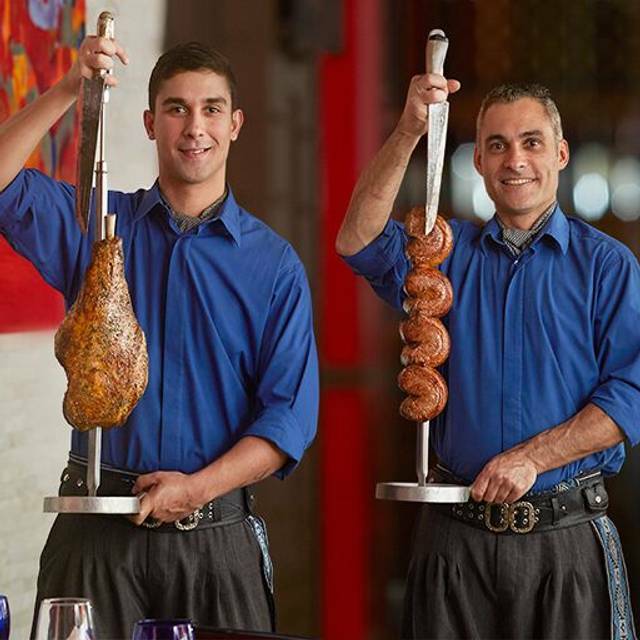 I usually have a great experience while dining at Texas de Brazil. However, this visit was a little different. The server did not acknowledge my party until I went to the hostess to notify them of the issue, so we were left waiting for about 20 minutes despite servers passing us by. The lobster bisque was also bothersome. It tasted as though it had been sitting out all day. It did not taste like the creamy, buttery, lobster bisque I usually get. It tasted like tomato soup. Also, the meat carvers weren’t as polite as they usually are. Overall, my experience could have been a lot better and I was very disappointed by my visit. I don't drink alcohol so I order a $4 pop. It comes in a small bottle and comes with no free refills. Service wasn’t great. Food was good but we didn’t get to try all the different options. Didn’t make it to our table. This unique service style was cool to experience in person. There was a few large groups that carried most of the noise. 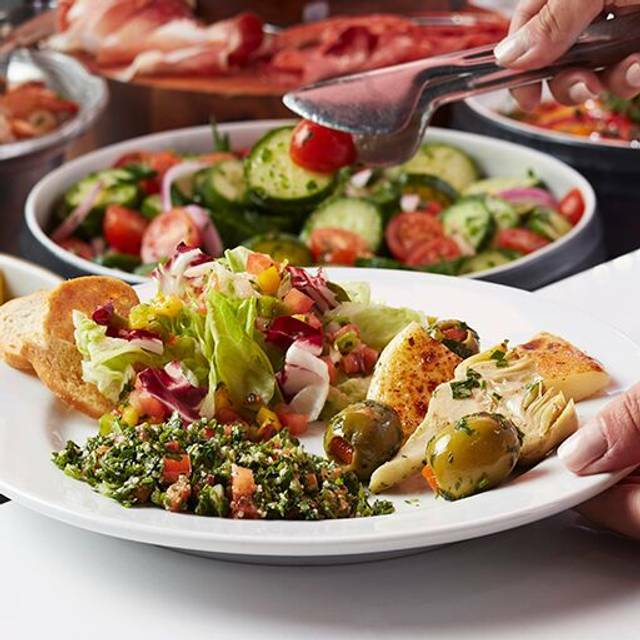 We knew ahead of time to take it easy on the salad bar and leave room for the main course. We were only presented with 6 of the 10+ entree options that servers walk around with. Our server seemed to try her hardest to get them to come over to our table but it didn’t really work. I recommend flipping your card right away to get a chance at more of the entree options. It would have been nice to have a menu that explained exactly how the service style worked. Our server did a great job trying to explain it however because of the noise we were left with more questions than answers. We might come back, but for the price, and lack of entree options, we won’t add it to our list of restaurants we frequent. As always, everything was great! The only issue was that one of the two bathrooms was out of order and the coke one of our party ordered was miniature! Awesome food. Well prepared and very delicious. Service was great and returned often. We were seated with minutes after we arrived and service was great. Salad bar had a great variety and cuts of meat came around plenty. Went for my boyfriends birthday, the servers were nice but seemed preoccupied. The guys who brought the food around were nice but it seemed like there wasn’t enough food to go around. It definitely wasn’t worth the $100 that night. I may have been just a fluke night but I won’t be going back anytime soon. I recently went with a group of friends for my birthday. It was everyone’s first experience. We all loved everything we ate. The meats were delicious and the salad bar had a great variety. 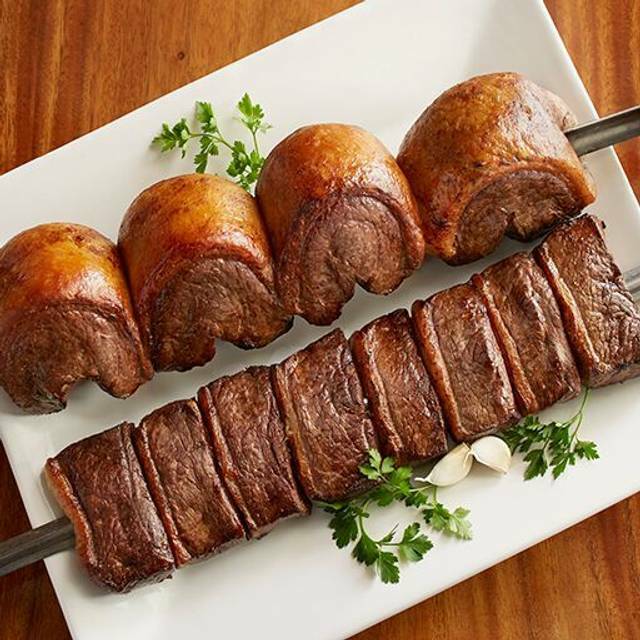 I would recommend this restaurant to everyone, especially if you’re not familiar with a Brazilian steakhouse! Very good quality food, did not eat as much as we paid for the price, the servers with meat only came around once or twice with our experience. The atmosphere is beautiful and the other service was great. Tables next to and around the salad bar and server's stations (registers) are too tight and do not feel intimate enough. Multiple people are always standing directly behind or next to you. Very uncomfortable. Patrons and workers are so close at times, that they are touching my chair, jacket or arm. The food was great and our waiter was the bomb! I took my boyfriend for his birthday and he was in love with the atmosphere and the food. Amazing food, love the atmosphere, and we have yet to have a "bad" waiter/waitress. Not a single complaint! It definitely isn’t what it used to be. Service was poor...and the food was not up to par. Didn’t see many staff walking around with meat. Definitely has gone down hill. Had a table of 5. Work/play. Salad bar was huge and the food was amazing! And the meat was incredible as well!! Bacon Filet, Prime rib, chicken, sausage....everything was great. Waiter was right on it the whole night. Definitely will go back. The food was indescribable. The Top Sirloin and Filet was seasoned to perfection. The beef is prepared to medium rare, but my wife explained to our waitress she doesn't like medium rare and the waitress notified the kitchen staff and they continued to bring medium wee to the table. Our waitress was excellent. The wait staff and servers are constantly checking on the tables to ensure no one is waiting too long for any items or drinks.